- Videos can be up to 2 minutes long. - Full cosplay is recommended for video (A full costume is a must have for the panel). The costume has to be a canon outfit from the show BBC SHERLOCK. - This panel is G - PG-13. PLEASE stay there in your audition and the panel itself. There will be children present in the audience, and this is a family friendly panel. (I've met 10 year old *and younger* Sherlock fans.) To put it simply... If you don't see it in a PG-13 movie then don't do it or say it. - The deadline for character auditions is May 18th. -You can post up your video auditions on Youtube, but please do link them to me. If I can't find your video then you're not getting the part. I'll watch every single video. Please link your video and let me know who you're auditioning for. - Panelists will be expected to be outside the panel room at least 5 minutes early. 1) *in-character* Why you want to be in the panel. 2) *out of character* Why you want to be in the panel. You can do a skit, dance, etc. (this isn't necessary though). - The Ask A Detective: Sherlocked Edition is PG-13. Which means the panel is family friendly! - This panel is specifically about the television series SHERLOCK which belongs to the BBC. - The basis of this panel is for the crowd to ask the 'characters' (actors/panelists) questions. The 'characters' (actors/panelists) will reply to the questions in character. The crowd could even ask the 'character' if s/he would be willing to do something. (Such as ask Sherlock to apologize to John, etc.) The 'character' can then decide if they will or won't do such action. - Try to ask every character at least 2 questions during the panel. Trust me, Sherlock will probably get asked a lot of questions. So, why not ask Irene a question, or another character whom may be left out. I've seen panels where one character blatantly is ignored and thats just not cool. - IF YOU DO GET THE PART, BUT CANNOT MAKE THE PANEL IN TIME, I WILL HAVE TO PICK A REPLACEMENT FROM THE CROWD. Please understand that the show must go on, and that if you can't keep track of time, the panel can't wait for you. Once at a panel one of the panelists hadn't come until 40 minutes into the panel. Thank you for understanding. 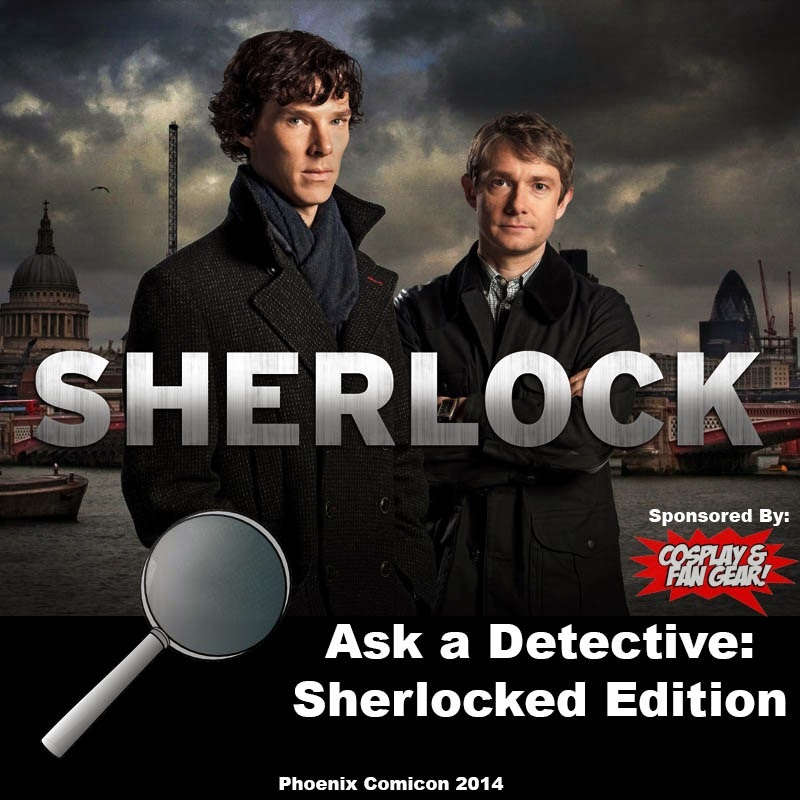 - Anyone who doesn't follow the rules of this panel and/or of Phoenix Comicon will be kicked out of the Ask a Detective: Sherlocked Edition panel. -Any questions? ask away! If you have any questions please ask me! It can be anything you're not sure about. I will be more than happy to help clarify. I will reply to all questions and comments as soon as I can. I will be allowing the main 8 characters into the panel.. I want to see auditions! - More information will be put up as we get closer to the convention. Thank you so much for reading this! I hope to see you at Phoenix Comicon 2014. We here at Cosplay & Fan Gear, LLC would like to wish you a Happy Valentine's Day ahead of time! Click on the pictures to learn more. Expect lots of new stuff coming from us very soon.